Metalworking Fluids Market size was more than USD 10 billion in 2017 and will witness 4.7% CAGR during the forecast timespan. Robust growth in the automotive industry is amongst the major factors which has propelled metalworking fluids (MWF) market size over past few years. According to International Organization of Motor Vehicle Manufacturers, global vehicle sales in 2017 exceeded 96 million units and shall continue to expand at promising growth rate in the coming years. Metals are widely used in the vehicles to provide durability and structural strength. Therefore, these products are essentially required in the automotive business as coolants for metal removal, forming, treating, and protection. MWF increases the vehicles’ component life by maintaining lubrication, minimizing wear and reducing physical & thermal deformation. The product also delivers superior surface finish and texture in welding and cutting zone. Furthermore, increasing consumer spending towards vehicle modifications will stimulate the product demand significantly by 2025. These fluids help in lubricating the cutting tool edge, which provides a cleaner cut along with enhancing the overall work hours of the tool. Metalworking fluids have main objective of cooling and lubricating the machining process. However, rising hazardous waste dumping has given rise to numerous environmental issues and contributed in natural resource pollution to a major extent. This shall hamper MWF market size in the coming years. 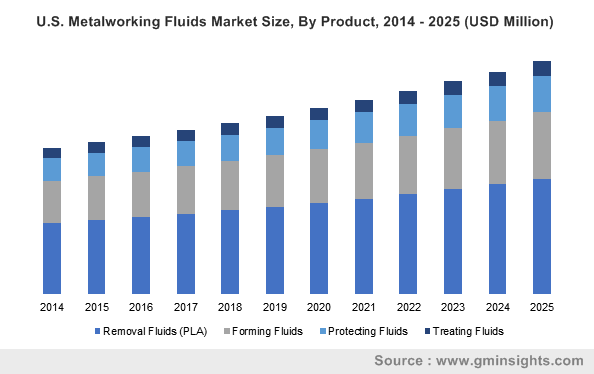 Furthermore, health risks pertaining to workers that arise from chemicals and microorganisms in metalworking fluids shall pose a great threat to metalworking fluids market over the next few years. Rigorous environmental regulations have compelled manufacturers to implement recycling programs. The prevalence of these strict legislations towards the environment and worker safety may hamper the product demand over the forecast period. Soluble oils held the largest share in global metalworking fluids market in 2017. Soluble oils are metalworking fluids which have oil content more than 50%. The high oil content provides ideal lubricity for cutting operations, protection to the machine tool and improves surface finish. They are suitable for general purpose cutting operations on low and medium tensile steels, brass, bronze, and cast iron. Synthetic fluids are likely to witness surged demand over the forecast timeframe owing to its unique properties such as low viscosity, good cooling & wetting, resistance to foul smell and rust & corrosion protection. They are being increasingly used as substitutes to petroleum-refined oils for operating in extreme temperatures. Aircraft jet engines use synthetic fluids on account of its non-flammability and stability at elevated temperatures. Steadily growing aerospace and automotive industries ensure rise in demand for synthetic fluids during the forecast timespan. The metalworking fluids are used in a wide range of applications such as removal, forming, protection and treatment. End user industries include automotive, aerospace, metal & steel fabrication, appliances and original equipment manufacturers (OEMs). The manufacturing sector involves cutting, bending, and assembling activities which require MWF for increasing the overall process efficiency. Metal removal fluids held the most significant market share of the global metalworking fluids market in 2017. The consistent growth in the metal fabrication and automotive industries has resulted in augmented demand for removal fluids. It is followed by metal forming fluids which are used to lubricate, cool and protect the equipment during drawing, stamping, cold heading, roll forming, extruding and welded tube rolling. Asia Pacific led the global metalworking fluids market in 2017. It is the robust growth in automotive and manufacturing industries which have driven regional product demand in recent times. In addition, the region is likely to retain its global share by 2025 and witness the maximum growth. Rapid industrialization along with increasing automotive sales are the major factors propelling the product demand in this region. China led the global automotive and shipbuilding industries in 2017 and the global shift of several multinational companies to this region on account of cost effective labor and lenient regulations shall catalyze the product demand in the coming years. North America contributes significantly after Asia-Pacific in global metalworking fluids market. The recovery of automotive industry and OEM after the economic downturn in the U.S. has emerged as one of the major factors propelling MWF market size in this region. In addition, steel and metal fabrication industry is growing at a consistent rate in this region, which will subsequently influence product demand during the forecast timeframe. Increasing manufacturing hubs in Brazil shall be positively influencing metalworking fluids demand in the region by 2025. 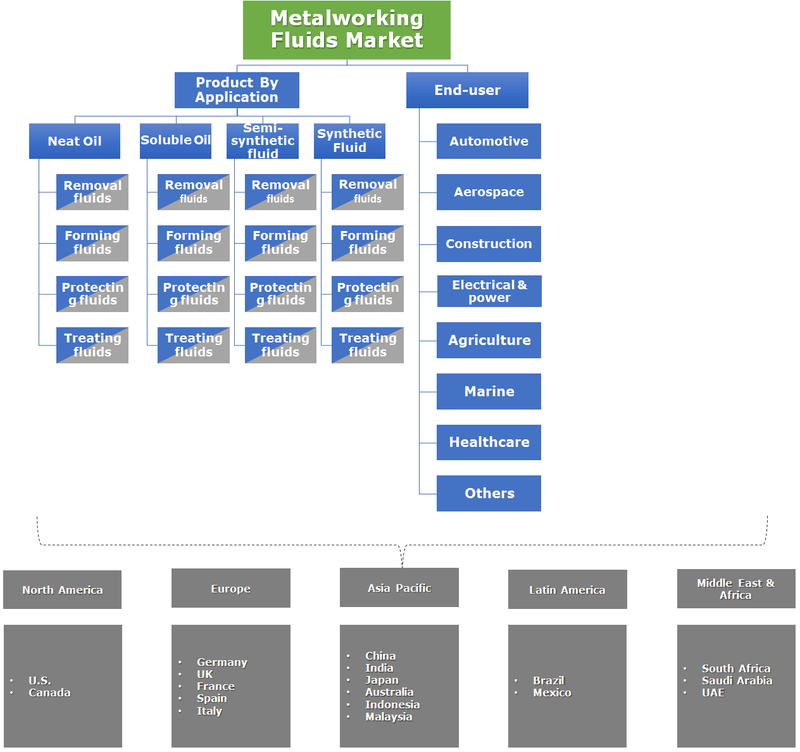 The metalworking fluids market is highly competitive with many multi-national players such as Total, ExxonMobil, The Dow Chemical Company, Henkel Corporation, Castrol Limited, Lubrizol Corporation and Quaker Chemical Corporation. These manufacturers produce MWF of various specifications suitable for distinct processes such as drilling, grinding, reaming, roll forming, polishing, honing, and lapping. These major players are involved in strategic mergers & acquisitions to strengthen their presence. In addition, they have entered into business agreements with end-user industries such as automotive to supply high-performance MWF over a consistent period of time. For instance, in November 2014, Castrol Limited entered into a strategic partnership with the BLOODHOUND Land Speed Record Project by Jaguar to supply advanced lubricant supply. Some manufacturers market their products with their own brands, for instance, Apar Industries Ltd. has a brand, POWEROIL, FUCHS sells MWFs under LUBRODAL, Lubrizol Corporation markets its product with ALOX brand name and Dow Chemical Company has a separate product segment under the name, UCON. Manufacturers distribute their products in the market with the help of third party distributors or through own sales network. There are distributors such as PolyOne Distribution, which markets products of Dow Chemical Company and ExxonMobil. Other prominent distributors in the market include MSC Industrial Supply, Moore Balliew Oil, EDM Sales & Supplies and Lampco Industries. Metalworking fluid is a type of lubricant designed especially for metalworking processes such as machining and stamping. MWFs are used in applications including grinding, turning, drilling, reaming, tapping, and broaching. These applications are classified in the categories of metal treating, protecting, foaming, and removal. The end-user industries extensively using these processes are aerospace, automotive, marine and general manufacturing. Preliminary raw materials required for the manufacturing of MWF are additives such as chlorinated lubricity additives, phosphate esters and amides.